“Come From Away”, the new show at the Ahmanson, is basically a feel-good musical about 9/11. If that sounds a little far-fetched, think of the advice to kids from Mr. Rogers: in the face of catastrophe, look to the helpers. In “Come From Away” the helpers are the residents of Gander, Newfoundland where 38 planes were diverted when US air space was shut down on the morning of September 11th, 2001. The result is a small town hero story as a cast of lovable characters tries to take care of 7000 stranded and frightened passengers. Dramaturgically, it’s a fascinating structure. The musical uses 9/11 as a sort of unifying counterweight. It’s enormity and import need only be hinted at to create a profound pathos. Delicately, the show refers to the events without overly exploiting them - allowing our own memories to fill in critical details (and importantly for a Broadway show, making it fairly family friendly). With the pathos taken care of - the musical flows a bit like a collaged New Yorker profile piece - weaving together a handful of story lines that all follow the tick-tock of actual events. We begin on the morning before everyone’s world changed - catching a quick look at life in a sleepy small town where everyone knows each others names. Then we flow through 5 days on the island as everyone experiences a strange time out of time displacement. We end with a coda 10 years later when a slew of those passengers returned to Newfoundland to mark the anniversary and show their gratitude for the radical hospitality. The ethos of the musical embraces a sort of everyone’s-welcome - we’re-all-one-family vibe. At times that’s charming, like when a gay couple goes to the local dive bar, worried they might encounter prejudice only to discover that everyone seems to have a gay uncle. But at times the formula makes itself a little too apparent. One number begins with a hymn, moves to a Catholic church and then mixes in a Jewish prayer with a Muslim praying. You get it, you probably even need it … but if we weren’t living through this challenged time - it’d probably be too much. Maybe the most interesting dance this musical is doing is with our own relationship with time. We’re close enough to September 11th that it’s still potent, far enough away that we can look again, and living in a political moment when the ethic of simple people doing kind acts for strangers feels all too relevant. If you’re looking for a feel good holiday show - that’s not exactly a holiday show - “Come from Away” might be a perfect night for the family from out of town. Now if you’re looking for a holiday show that’s a little darker and certainly a classic - grab one of the hard to get tickets for Jefferson Mays’ “A Christmas Carol” at the Geffen Playhouse. It’s one of the best pieces of theatre you’ll see this year. And if you’re into a holiday that’s a little queer (okay, very queer) don’t miss Taylor Mac’s “Holiday Sauce” at CAP UCLA, December 14th and 15th. 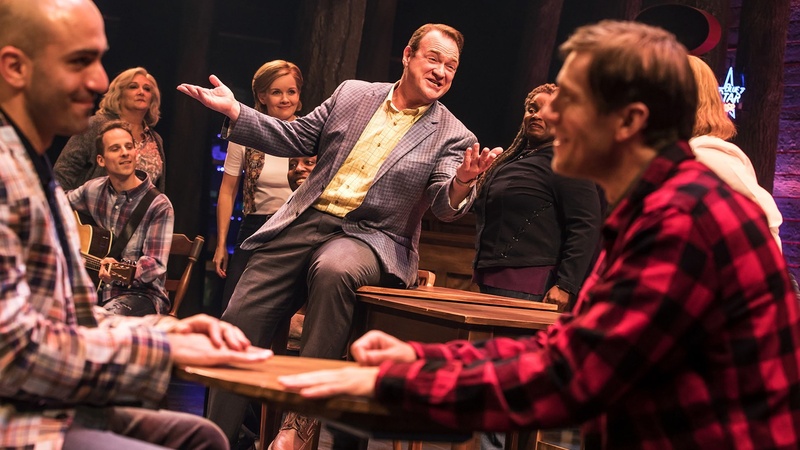 “Come From Away” plays at the Ahmanson Theatre downtown through January 6th. “A Christmas Carol” plays at the Geffen Playhouse through December 16th. Taylor Mac’s “Holiday Sauce” is at CAP UCLA December 14th and 15th.